"The world's first stereo valve acoustic pre-amp and active DI"
NAMM 2017: Orange Amplification has launched its first ever acoustic pre-amp in Anaheim, and it's a typically bold and ambitious piece of kit. Billed as the world's first stereo valve acoustic pre-amp and active DI, the Orange Acoustic Pre has twin channels, that can either be used independently or blended: Channel A features a tonal response Heat control, while Channel B, which is solid-state aims for 'outstanding clarity'. Orange Amplification proudly present the Orange Acoustic Pre, their first foray into the acoustic pre-amp market. 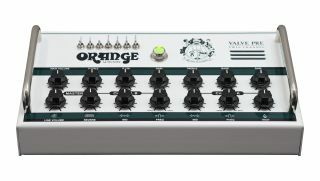 Having been a pioneering force in the world of electric guitar amplification for almost fifty years, Orange are known for producing some of the finest sounding, most dependable valve amps in the business. It is only right that Orange's maiden voyage into the acoustic world will set a new standard for hi-fidelity tone. Handmade in the UK, the Orange Acoustic Pre is the world's first stereo valve acoustic pre-amp and active DI, offering supreme clarity and unrivalled performance. Designed and built to be used on stage and in the studio it affords the same warmth, natural compression and rich harmonics to acoustic players, previously only available to their electric counterparts. The twin channels can be used independently, or blended together. The unique valve Channel A is for active and passive instruments with completely different circuitry to most valve guitar amps. This gives it a much wider frequency range enabling it to capture every subtle nuance of an acoustic guitar. It features a variable 'Heat' control which directly affects the tonal response of the valve, bringing in more sparkle and 'air' as it increases. This adds extra detail to delicate finger picked passages, whilst turning the Heat control down reveals more rounded tones that are perfect for flatpickers. The solid state Channel B has a different, slightly softer character with outstanding clarity. This channel has ¼ inch instrument input and an XLR input with switchable 48V phantom power. Both channels have a three band EQ with parametric mid-control and switches to correct phasing problems. The unit also features a stellar stereo reverb, plus effects inserts for each channel, balanced and line outputs.